Three policemen killed in Egypt as Islamist violence continues; authorities ramp up security in anticipation of more attacks. Islamist terrorists shot dead two Egyptian policemen guarding a Coptic church on Orthodox Christians' Christmas Eve, bringing the number of police killed Tuesday to three. The shooting took place in the central city of Minya, a provincial capital which lies some 135 miles south of Egypt's capital Cairo and is home to the country's largest Coptic community. Police have cordoned off the area and are currently pursuing suspects, they said, adding that security has been ramped up around churches. Copts make up roughly 10% of the Egyptian population, and have long complained of systematic discrimination both by authorities and the country's majority Muslim population. Attacks against Copts - an indigenous ethnic group who practice their own distinct brand of Orthodox Christianity - escalated significantly following the ouster of Muslim Brotherhood president Mohammed Morsi in July 2013. 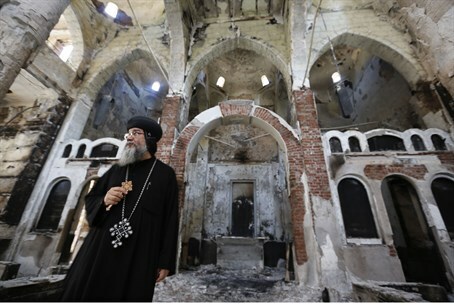 A large number of churches and other Christian establishments were burned and ransacked and many Copts were murdered in a string of deadly attacks, after Muslim extremists scapegoated the minority group, which they said backed Morsi's ouster. Since then the wave of attacks have ebbed, but Egyptian Christians say they are still being targeted by Muslim gangs. It follows an incident in nearby Libya in which a group of Coptic Christians were kidnapped, and later released, by an armed gang. Minya has been the scene of numerous anti-Brotherhood court rulings, including several mass-death sentences issued by the city's courts against hundreds of Brotherhood supporters.